Sea-buckthorn berries have a pleasant, but very tart flavour. 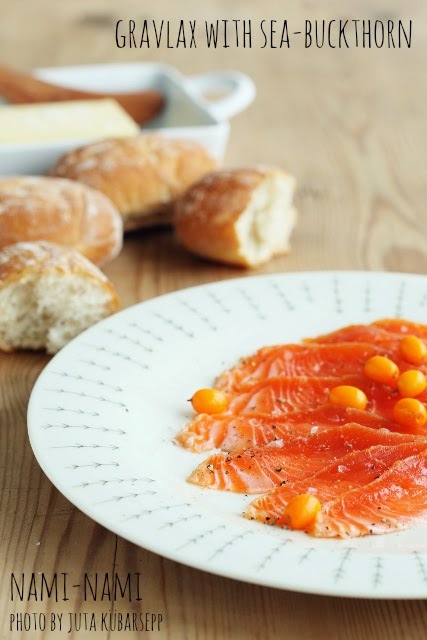 They can be used instead of lemons - and here sea-buckthorn juice is used as a replacement for lemon juice in curing some nice salmon. Use highest quality fresh fish to make this dish. Remove any bones with pliers. Brush with sea-buckthorn juice. Combine salt, sugar and pepper, spread the curing mixture over the fish and rub it gently in. Cut the filet into two even chunks, place them together, flesh sides touching. Wrap the salmon tightly with plastic wrap and refrigerate for at least 24 hours or up to 48 hours. Unwrap salmon, discarding the curing mixture (rinse quickly, if necessary, and pat thoroughly dry). Tp serve, place gravlax skin side down on a cutting board. Cut the gravlax into thin slices with a fileting-knife (a long, narrow-bladed knife), cutting against the grain, and slightly diagonally. I would like to invite you to participate in a survey for my bachelor thesis, which is about participation in blogbased virtual communities on the internet.